From 1733 until 1777 only Augusta and part of Richmond County (known as St. Paul in 1758 when the parish system was implemented for political purposes or Augusta district for military purposes) was the only part of today's North Georgia in the English colony. In 1777 this changed with the acquisition of Wilkes County, Georgia, which extended the control of the Americans well into North Georgia. During the American Revolution Wilkes County played a pivotal role in Georgia history. When the British were claiming to have control of the newly-organized state a government-in-exile was created at Fort Heard (Washington, Georgia). 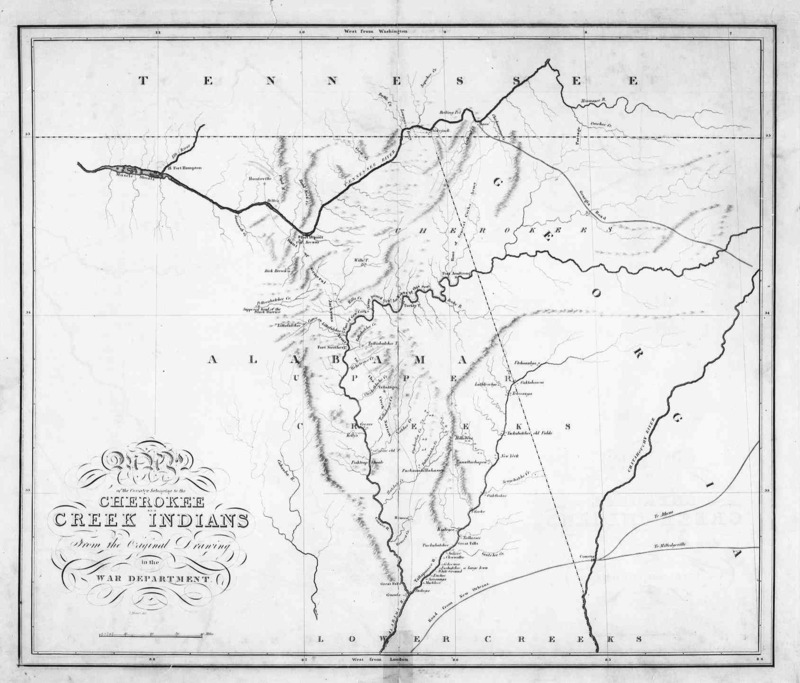 Between 1783, when the Cherokee Indians and Creek Indians first ceded land to the newly-formed state of Georgia, and 1828, much of North Georgia remained under the control of the Creek and Cherokee. The first cessions, made between the Cherokee and Elijah Clarke at Long Swamp in 1782, were in northeast Georgia and extended west to include parts of present-day Habersham and Banks Counties. 1784 saw the creation of Franklin and Washington Counties from the combined Creek/Cherokee cessions to fulfill the promises of land make to men who fought in the Revolution. Georgia's economy did not do well following the end of the American Revolution and politicians were counting on two things to change this. By attracting veterans in North Carolina and Virginia with parcels of land granted under a headright system they hoped to increase population (and revenues). The government also hoped to sell land. With the offer of cheap land Americans began to flock to the state, raising the population from about 33,000 in 1783 to 82,548 at the first census in 1790. Expansion west was not the only direction from which settlers made the journey into North Georgia. Fannin County, in the north-central part of the state was among the first areas to be settled when Amercians headed west through a gap in the Smoky Mountain to Fort Loudon, Cherokee Territory. Heading south on the Tennessee River, some settlers explored the Ocoee River and settled near the eastern headwaters of that river. They also followed the river further south and west. Some of these settlers ended up in present-day Catoosa County and Walker County. In 1784 Georgia worked a deal with future Tennessee governor William Blount to buy land and form a county near Muscle Shoals, present-day Alabama. Luckily for Georgia Blount became more interested in forming the state of Franklin and nothing happened at Muscle Shoals. This would not be the state's last attempt to earn a little spare cash through the sale of land. In May 1794 General Elijah Clarke crossed the Oconee River with the intention of establishing the Transoconee Republic. He recruited men and headed west, erecting fortifications in Creek territory to the alarm of both Georgia and the United States. He also negotiated with the French to mount a joint attack on the Spanish. The Oconee War and Clarke's Transoconee Republic came to an end on September 28, 1794, when Clarke surrendered to a large force of Georgia and Federal troops even though his men voted to stand their ground and sell their lives dearly. The Federals then burnt Fort Defiance and the other fortifications of the short lived republic. In the east, the Unicoi Turnpike brought settlers from the north to northeastern Georgia. Many of these settlers encroached on Indian lands causing much consternation to Cherokee in the area. Brutal attacks by whites on American Indians and vice-versa created an unfriendly atmosphere that lasted until settlers completed the subjugation of the Indians in the area by 1820. In 1803 the Cherokee agreed, in principal, to a Federal Highway(Map) to join Knoxville and Savannah meeting to a ford of the Tennessee River now under Nickajack Lake. Road construction started immediately in the Cherokee Nation with the Cherokee collecting tolls at river crossings as a form of repayment. Georgia contributed $5,000 to its completion in 1804 and the road was known locally as the Georgia Road. The Cherokee viewed the settlers desire to have such a road built as a curiosity at the time, but agreed in writing to the road in the Treaty of Tellico, 1805, the year it was finished. About 1816 most of the Old Federal Road traffic rerouted to a ferry landing further up the river run Daniel and John Ross at present-day Chattanooga. In spite of completion of this and other roads, river travel remained the chief form of transportation in Georgia until the advent of a major rail system in the state in the 1830's. The Old Federal Road ran from Chattanooga through Ringgold Gap southeast to Tate, then on a more easterly path to Jefferson and Athens. Portions of the road are still visible, and the keen eye can spot portions of the bed as an old farm most of the path in north-central Georgia. Along the road white and Cherokee establishments serviced the needs of the travelers as early as 1804. Chief James Vann, whose home sits near the path of the road, controlled many of these establishments including the ferry across the Chattahoochee River, the start of Indian Territory. As the state of Alabama began to grow after the Creek War of 1814, a second set of roads was developed running west. Although discrepancies exist as to the exact routes and numbers of these trails, three and possibly four routes heading west from the Chattahoochee were called the Alabama Road. The most famous of these followed the route of the Hightower Trail, running from near the present location of Gainesville, Ga. to Cartersville(built on the Cherokee town of Hightower, then west through Euharlee. Gravestones on this route date to 1808. The first United States Post Office was established on the Federal Highway in Rossville(1819) almost 15 years before the Cherokee were forced to surrender northwest Georgia. Counties began to organize further west in North Georgia. Gwinnett, Habersham and Hall Counties were formed in 1818. With Rabun County, which formed the following year, Georgia stretched from the Atlantic Coast to the Chattahoochee River. Most residents of the newer counties were subsistence farmers because markets were limited by the lack of transportation. In 1828 Georgia Senator Wilson Lumpkin and surveyor Hamilton Fulton changed that with a ride from Decatur, Georgia to Ross's Ferry on the Tennessee River. They were exploring the feasibility of a canal connecting the Chattahoochee and Tennessee River. While Lumpkin and Fulton decided a canal was not feasible, a new technical advance would be - the railroad. Over the next decade, with the Western and Atlantic Railroad and the "discovery" of gold the face of North Georgia would alter dramatically.